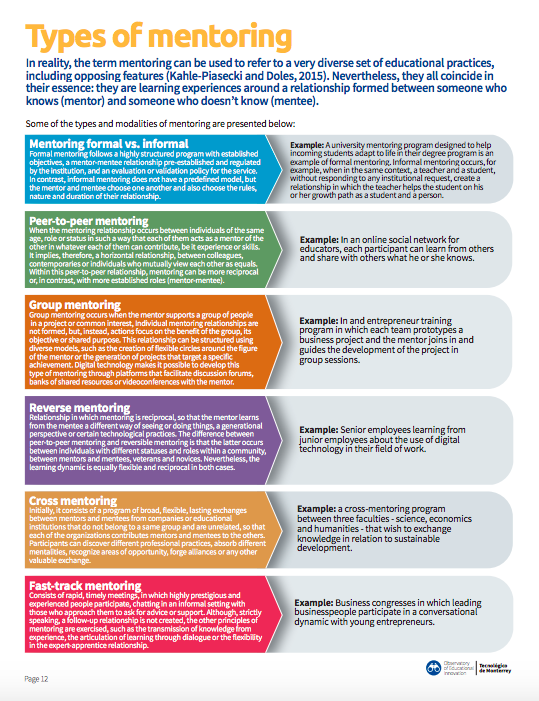 Mentoring is an educational relationship between a mentor and a mentee whom the mentor teaches, listens to, shares with, accompany, supports, and guides on his or her learning pathway. Mentoring is a flexible relationship that can be understood and developed in many ways, in both business organizations and educational systems, where it is gaining prestige year after year. The boom of mentoring programs over the past few years has been so notable that mentoring has been called on to play an increasingly important role within the media ecosystem and practices with which we learn in today’s knowledge society. of history, from classical antiquity to the Digital Era.